All M2M amplifiers and repeaters listed below are compatible with your Koodo service. Koodo M2M Signal Boosters for use in ATMs, lotto & vending machines, remote monitoring systems, etc. Koodo also known as Koodo Mobile is considered as a mobile brand being started by Telus and so referred as most oriented towards those younger customers. Koodo would differ from Telus through not requiring any fixed term contract. This carrier is currently providing prepaid and post-paid services. Since it is a subsidiary of Telus, it is offering extensive coverage as well as strong presence into mobile retailers, therefore, allowing the carrier to gain presence all over the nation. Being one of the major cell phone carriers in Canada, Koodo is expected to provide high-quality service to their customers. And so among the problems that are associated with being a carrier slow or even dropped internet connections. These problems are considered to be due to reduction of signal indoors inside cabinets or enclosures where cellular modems are placed such as in ATMs and Lotto machines. Therefore, stronger signal is definitely needed to such devices that attempt to access cellular signal from deep within machines which in turn are inside malls and buildings further causing low reception. With that being said, Koodo signal boosters are needed particularly in terms of machine to machine applications. Nowadays, we are in a world wherein machines absolutely play great roles in the society. There are so many machine to machine applications in the society such as ATMs, fleet telematics, asset tracking systems, vending machines and also remote monitoring control systems. As we’re living in a world wherein technology almost invades the humanity, M2M applications are of great importance. Though these kinds of applications could offer convenience and ease, still there are instances wherein it could as well pose some problems. And that could be due to poor signal. The said problems in M2M applications could be addressed through using Koodo signal boosters for M2M. weBoost Security 4G M2M for Koodo Mobile. Boosts 3G and 4G LTE data signal for those cellular being connected to the security panel. Designed for security systems such as door entry or alarm system. Installed and connected to equipment for reliable 4G signal. With robust physical design and secure communication method. Can be used without interference coming from external sources. Faster downloads and uploads wherein you can transfer important data from, and to your equipment. Reliable connection for transmitting time-critical or sensitive information. Minimized connection drops or packet loss. Improvement of reception as it is ideal for those in areas with lower signal. Wider area will be covered wherein it will open more locations for installing the equipment. weBoost Signal 3G 470109 M2M for Koodo Mobile. Particularly designed for M2M applications. Ideal for devices requiring 3G connectivity located within low signal areas. Increase connectivity from the device into the cell site. Includes amplifier or booster and cables. Ready to be integrated with CDMA modems as well as other equipment. Has 12 inches long magnetic mount antenna intended for easy installation. Works with all kinds of antenna and easily connected to the equipment. Allows fast and stable 3G connection. Improve performance of the data coming from, and to the device. Mobile data could be sent from equipment at a faster rate. Works with almost all popular cellular carriers, particularly with Koodo & Telus. 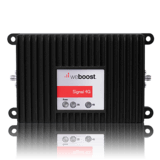 weBoost Signal 4G 470119 M2M for Koodo Mobile. Boost performance on the 4G network from connected device into the cell tower. Works in a bidirectional fashion improving outbound and inbound communications. Could be used with different equipment requiring 4th generation signal. Comes in a compact form intended for easy fit within confined spaces. Operates in wide band for the purpose of having maximum signal amplification. Comes with mini magnetic antenna ensuring maximum strength of signal. Complete with needed cabling, connectors and also a user manual. Compatible with different equipment such as specialist antenna. Suitable for professional installation in all types of M2M applications. Stabilize intermittent connection if equipment is installed within signal dead spot. Can be installed within remote areas wherein there is a very poor 4G signal as this could easily bypass exterior and interior obstructions which deteriorate the quality of signal. Flexible range of options for installation. Improvement of speed in transferring data and fewer situations of retransmitted data. weBoost Signal 3G 470209 Compact M2M for Koodo Mobile. Direct connection cellular booster for machine to machine applications. Used specifically for confined spaces with the use of 4 inches mini magnet antenna. Comes with amplifier, cables, power supply unit, mini-mag antenna, and also instruction manual. Perfect for DIY installation and easy integration with the CDMA modem installations as well. Can be connected with a wide range of antenna products intended for custom installation instances. Amplifies both outbound and inbound transmissions from M2M. Assurance of reliable or stable connection from the equipment to endpoint. Speed up communications and ensure fewer packets being dropped. Ideal for boosting data signal which uses CDMA modem connection. Time saving, energy saving. Increases productivity. weBoost Signal 4G 470219 M2M Hardwired Signal Booster Kit for Koodo Mobile. Connected to LTE modem for offering 4G signal boosting to M2M applications. Amplifies both outbound and inbound transmissions. Comes with amplifier itself, cabling, hardware power supply, mini-mag antenna, and a user manual. DIY friendly and compatible with LTE modems and all wireless networks in US & Canada. Can be utilized with other hardware such as different antennas for any kind of M2M installations. Used when signal is being intermittent providing stable connection. Increase the signal strength and also the performance of 4G connection. Transfer of data is more efficient and faster as well. Offers great return on investment. Fast, economical and more efficient power consumption. Reduce time costs and improve overall performance. weBoost Signal 3G 470309 M2M Booster With Hardwire Kit for Koodo Mobile. Best used in vending machines, fleet management, cash machines, security equipment and also other devices requiring data connection in communication applications. Compact and offers dual-band amplification which is helpful in providing constant and strong signal to, and from the equipment. Comes with 4 inches mini-mag antenna along with SMA male connector that will be linked to a device for maximum boosting of signal. Compatible with different equipment such as different kinds of antennae, perfect for M2M applications. Enhance signal for outbound and inbound communications. Produce more stable connection intended for connected device. Faster and more efficient transfer of data. Above listed are Koodo signal boosters for M2M by weBoost that you may consider if you’re in machine to machine application industry. Koodo will continue its mission of providing quality service to customers - You can ensure your devices receive it with one of above M2M signal boosters by weBoost.